I'll open by saying I've not had a huge amount of exposure to the Shin Megami Tensei series, with my only foray into the franchise being 2008's Persona 4 on the Playstation 2. But, I was totally enthralled with the game - its setting, art design and dungeon-crawling gameplay gelled with what I want out of an RPG. And this year's sequel on PS3 and PS4 is looking like it's going to be even more in line with my tastes. Let's look at why. WARNING: The following is totally fuelled by hype and is highly, highly subjective. Read at your own risk. 1. It's set in Shibuya. This one is definitely a personal reason. Shibuya is the setting of one of my favourite games of all time - The World Ends With You on Nintendo DS. The moment the Shibuya Crossing appeared in the first trailer for Persona 5, I was instantly reminded of my adventures with Neku, Beat and the gang. Shibuya worked so well as an RPG setting. Whilst the dungeon exploring will likely take place away from Shibuya judging by previous Persona titles, being able to revisit Shibuya will be a very good thing indeed. 2. The music is shaping up to be something special. Persona's music has always been great, but upon hearing the theme that accompanied Persona 5's second trailer, I grew incredibly optimistic about this game continuing the trend of solid music. If you haven't already, I suggest you give the trailer theme a listen. I really hope the rest of the soundtrack continues with this jazzy tone - the J-Pop influenced themes from Persona 4 were great and all, but it's very much par for the course for JRPGs. As soon as the jazz flutes kicked in during the trailer, I knew this is something a bit different. Very promising! 3. The protagonist is a cross between Light Yagami and the Phantom of the Opera. 4. The game's mascot is a cat. Definitely only here for the cat burglar pun. Persona 4 had Teddy the Bear, which was all fine and well. Persona 5 has Morgana the Cat. Cats > Bears. Sorry P4 fans, but Purrsona 5 takes this round. 5. The environments look vibrant and bustling. Not pictured - terrible street musician murdering Wonderwall. Persona 4 was never the most visually advanced of games - relying on the PS2 hardware in 2008, it couldn't stand up to the technically stronger graphical offerings on PS3 and Xbox 360. Persona 5 seems to be taking advantage of the extra power being afforded to it, as its environments look busier and feel better for it. 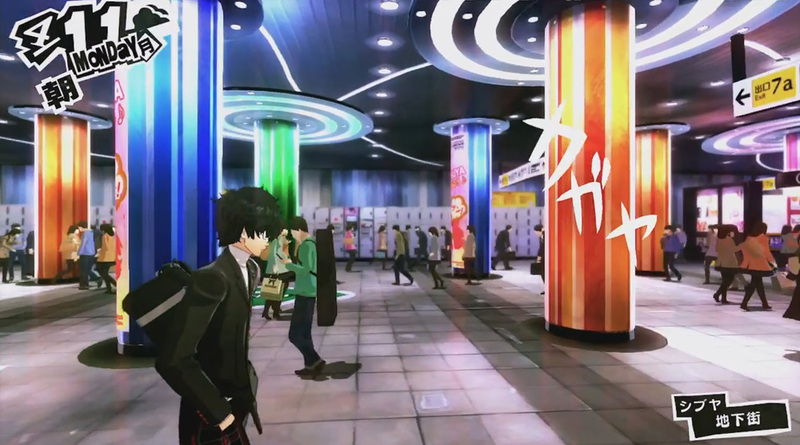 Even the classroom scenes, static in Persona 4, look alive in the sequel. The colours really pop and it's a treat to look at. 6. Even the menus look fantastic. This ties in with the previous point, but the menu design really is stunning. This isn't your sparse lists of items, but a stylish extension of the game's overall aesthetic. There's a reason the trailer focused on these menus - they're gorgeous. 7. The dungeons are more diverse than before. This is actually a recreation of Super Mario RPG's opening encounter with Bowser. If there's one area that Persona 4 struggled with, it was its dungeon-crawling. It was perfectly functional, but each dungeon was essentially the same but with a different skin and monsters populating its halls. 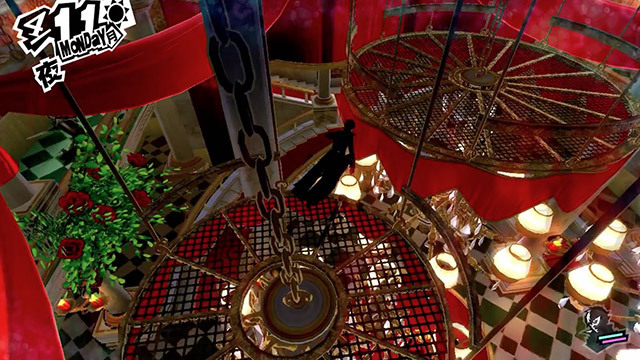 This looks set to change with Persona 5 - the gameplay trailer showed The Phantom leaping from chandelier to chandelier, sneaking around corners and rocketing from cover to cover to approach an enemy. If the dungeons are made to be more engaging than before, then a big gripe many had with Persona 4 is gone. Get Abe Lincoln on the phone, stat. I'm fully confident in Atlus's ability to put out a fantastic JRPG experience, and I'm fully expecting this to be the best game I play in 2015. Emancipation couldn't come soon enough.